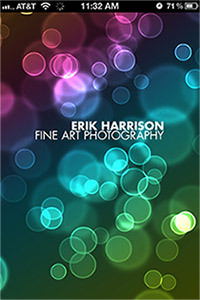 A pro photographer's site which is used both as an online gallery also well as an online store. The mobile version serves primarily as a mobile gallery to share with other photographers and prospective clients. 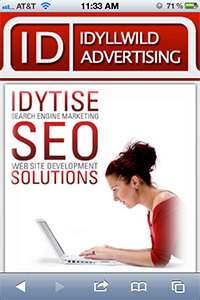 Skills used: HTML5, CSS3, PHP, jQuery Mobile. 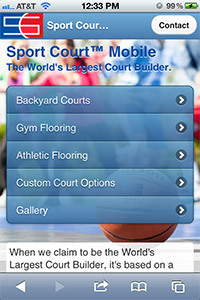 Sport Court needed a mobile friendly version of their site to allow a growing number of their mobile visitors to view the site in a phone friendly format. 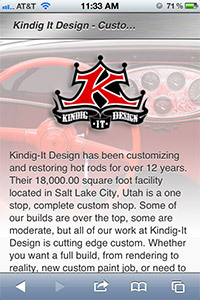 Mobile version of the Kindig It Design site. We noticed a large number of folks dropping off when they visited the site with a phone. That fall off was cut in half with the design and coding of their mobile site. 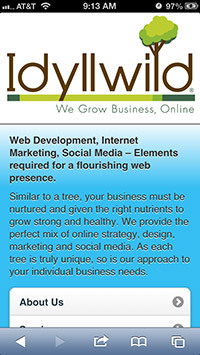 A project for Idyllwild Advertising. With an increasing traffic source coming from mobile devices we thought it a good idea to put our own version up. We took a look at the traffic for folks looking for a bailbonds person and a majority of the traffic was coming from mobile devices. 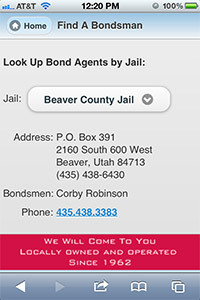 Hence the need for a mobile ready bail bond lookup. 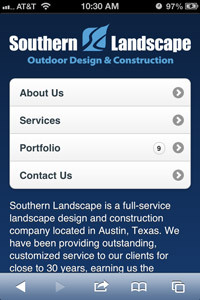 With a growing amount of web traffic coming from mobile devices this landscape design firm wanted to create an easy way for folks to view their work and contact them easily via the mobile site. A demo of the what can be done with exsisting content and graphics. All the major services and a comprehesive gallery were put together in a day.